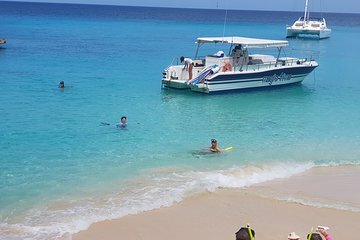 Make your way to your chosen departure point (either the Yacht Club or Dock Maarten) at 10 a.m. Make sure to bring a towel, swim suit, change of clothes, and sunscreen. Meet your captain and crew, then have a chat about planning the day and what you'd like to see. The captain can advise you on the weather conditions and suggestions for your itinerary. Cruise out of Simpson Bay Lagoon, taking in views of the mega yachts docked in the marina. Find a comfrotable spot on board as you cruise over to the French side of the lagoon to see the Marigot Marina Royale, then head over to the French Nature Reserve. You could also choose to check out the floating bar or hit Creole Rock or Green Key for some snorkeling. Other options are Sandy Island or Little Bay in Anguilla. Post-snorkeling and swimming, refuel with some mini sandwiches and a drink. Chow down on a barbecue lunch on board, then stop at Maho Beach on the way back to your drop-off point. This private tour for you and your party is entirely flexible and guarantees personalized attention from your captain.